I am going through the slow, painful but ultimately interesting process of researching the realistic prospect of installing a micro hydropower system in an old mill race about a mile from my home. At present there is nothing on the site except a very old mill race with water gushing through it. This water comes from a spring about a mile up the valley which never stops flowing, even in 1976! Yes, a local farmer told me that. So there is no existing mill equipment on the site, just a mill pond and a large drop of over 3 meters from the pond to the outflow, hence the idea of the overshoot wheel in the illustration. 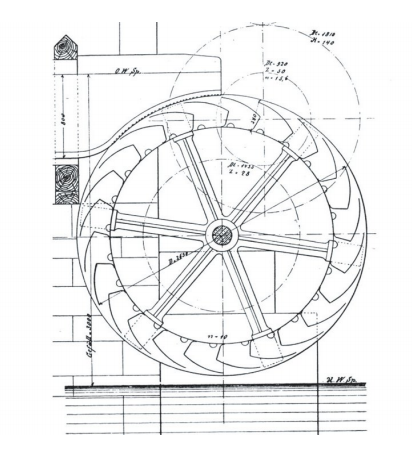 The company I'm dealing with are suggesting an overshot waterwheel design, the location is remote and maintenance needs to be kept to a minimum. This sort of design requires no debris grill or fish screen. It's not a cheap system to install however once it's there it churns out electricity for next to nothing. I am funding the assessment myself and will eventually present the findings to the village, the land owners, farmers and many people in the village are interested. One fact I've discovered in my research, there are over 10,000 such sites in the Southern UK alone, this is already existing mill sites, many dating back to Anglo Saxon times. Not all of them would be suitable for such change of use, but the ones I've seen are producing serious amounts of electricity with minimum impact on their immediate environment. Am I mad? Probably, but I will press on.